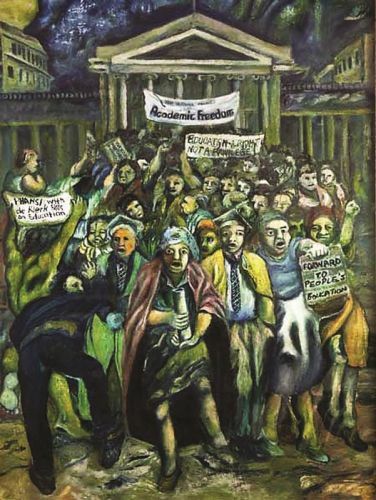 'Extinguished Torch of Academic Freedom', by Keresemose Richard Baholo (1993), the first Black student to receive a master’s degree in fine art at UCT. Ironically torched as part of a decolonisation protest at UCT on February 16th, 2016. The artist, on hearing of the burning of five of his paintings, was philosophical. While expressing his dissapointment at the senseless use of violence and the destruction of property, he sympathised with the protesters, saying that their demands and frustrations were valid. 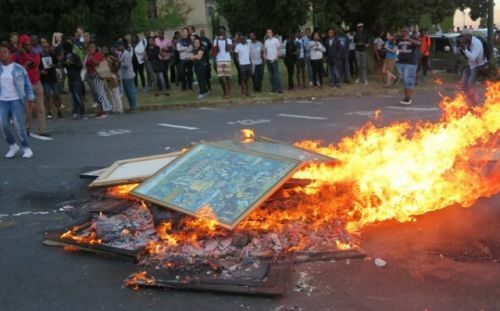 Protestors burning art on 16 February 2016 at UCT. Photo by Ashleigh Furlong for GroundUp. In my capacity as the director of the Michaelis School of Fine Art, I strongly condemn the destruction of artworks and the threat to university collections. 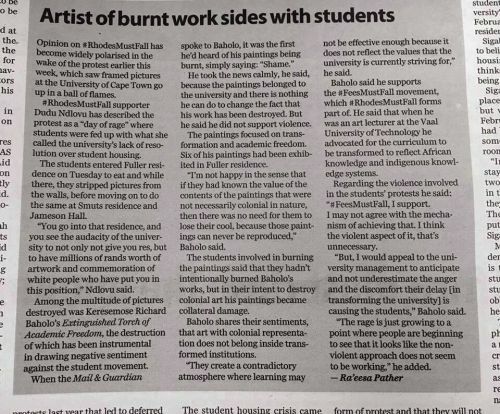 The loss of five works by Keresemose Richard Baholo (1994), the first Black student to receive a master’s degree in fine art at UCT, is particularly tragic. These paintings, produced during 1993, are part of a valuable archive of a period in our collective histories, and have been used in several courses to teach about ways in which the past is signified in the present. It is ironic that these works that celebrated academic freedom should have met such a fate. Our students deserve equal opportunities, and we recognise, and decry, the failure of government to provide adequate resources to ensure this is possible. However, destroying artwork impoverishes us all.